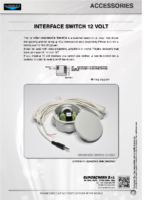 The 12 VOLT INTERFACE SWITCH is a switcher based on a relay that drives the opening and the rising up of a motorized screen, depending if there is or not a continuous 12 Volt DC power. It can be used with video-projectors, amplifi ers or Home Theatre decoders that have an output of 12 Volt DC. If you install a 12 volt interface you cannot use neither a remote control nor a switcher in order to switch on/off the screen.